Jim Warren Handsigned & Numbered Limited Edition Giclee on Canvas:"Dream Maker"
About the Art: Jim Warren is one of the most creative and prolific artists of our time. If you are not familiar with his name, you have undoubtedly seen his work. 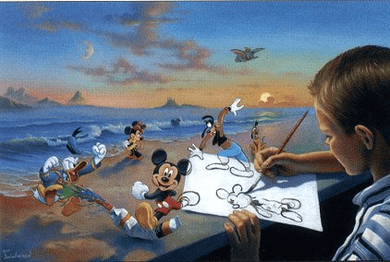 His fine art paintings and personalized portraitures have been commissioned by a clientele list that includes world-famous celebrities and prominent business leaders, and his collaborations with marine life artist, Wyland, are widely acclaimed. His paintings have been seen around the world on billboards, large outdoor murals, set props for TV shows, and Fine Art Galleries coast to coast now carry his works.